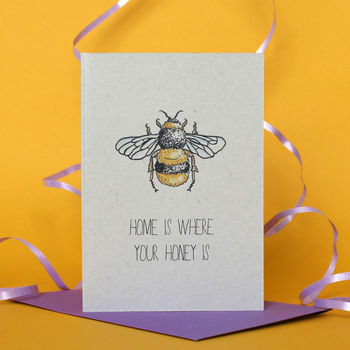 A cute bee themed card with an illustration by Adam Regester. This card with a current theme is hand made to order and printed on recycled card. It's blank inside for your own special message. It comes with a good quality envelope and will be well-packaged to ensure it arrives in perfect condition. Recycled paper / card and ink.